There's a considerable chance that any given piece of art with a heart has been made by Jim Dine. The artist has been prolific in his 60-plus years of producing works, from large-scale Pop-inflected paintings to emotive and lush collaged works-on-paper. Even while working within a childlike vocabulary, Dine has often been considered alongside rougher painters like Robert Rauschenberg and Jasper Johns, and has surprised critics and audiences by flexing his muscles as an original generator of performance art "Happenings" or towering series of sculptures. Dine never fails to surprise at the auction block. His best at-auction works, stemming from the 1960s, often double their pre-auction estimates. His two highest results were $420,000 in 2007 and $418,000 more recently in 2015. 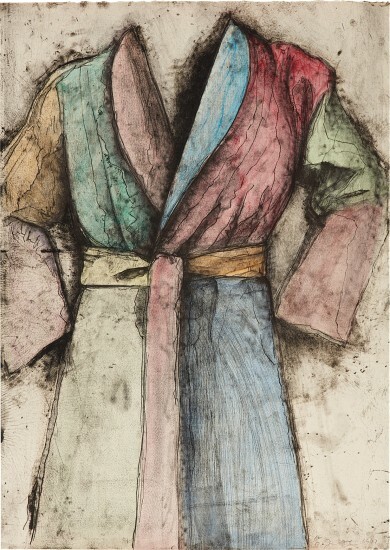 Offset lithograph, etching, drypoint and electric tools with hand-coloring, on Arches Cover paper, the full sheet. Signed, dated and annotated 'A/P' in pencil (one of 3 artist's proof, the edition was 10), published by Pace Editions Inc., New York, unframed.